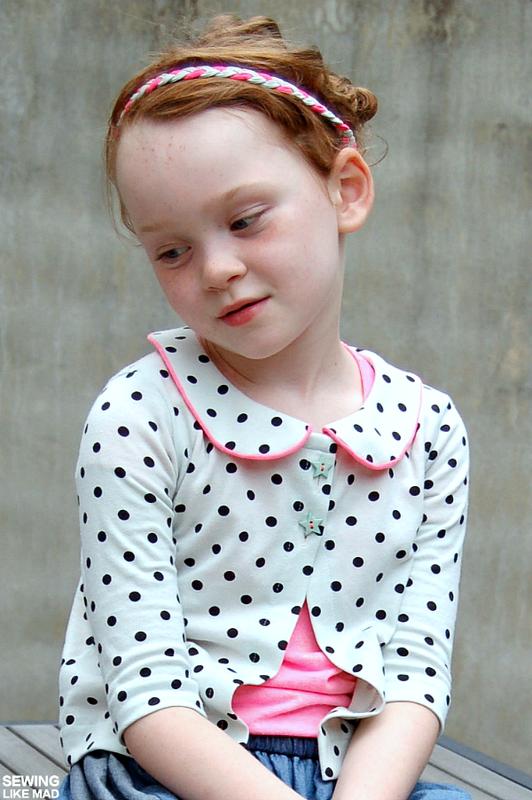 Sewing Like Mad: First Day of 1st Grade....and more! Heeeeey, I'm back from vacation....and guess what the only thing I missed while I was away having an amazing time in Denmark with family and friends.....yes, sewing! (Sorry husband who stayed back to work, ha). So after the worst jet lag fogs disappeared I went to my sewing room and did some fun sewing. You know the type that creates something you or your kids actually need in their closet. In this case skirts and cardigans!! For awhile when my kids were much younger I almost only made skirts because that was the fastest and I liked finishing the project within reasonable time. Then they got older, started school and was able to play by themselves and I made more complicated and longer projects.....and suddenly W barely had any skirts, ha. Today this little lady starts 1st grade and this is what she is wearing. 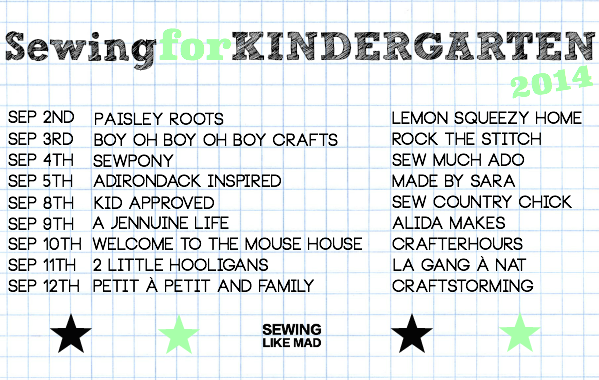 AND talking about school....in the bottom of the post you can see the lineup for this year's Sewing for Kindergarten - I'm SO super proud of all the participants that has agreed to show us what they have made for their kindergartners! Okay, back to this outfit! I woke up from a quick jet lags nap and immediately 'got the idea' to make this skirt.....after a bit more waking up, I realized that my brain had tricked me. It was not my idea....I had seen this skirt on A Jennuine Life as part of Skirting the Issue a month back, forgot about it and now it had popped up in my brain as my own idea - ay ay ay, I'm glad I caught it! I'm sure the big pockets from The Sally Dress from Very Shannon also had an influence on my brain that day. I wanted my side panel with the pocket a bit wider than Jennifer's Pip Skirt and because the skirt is so simple I ended up drafting my own pattern - not because there is anything wrong with Jennifer's pattern (I have not looked at the instructions so I have no idea, ha but I'm sure it's fine) but that simply seemed easier for me to make it exactly the way I wanted it and for W's measurements the first time instead of altering her pattern. Both fabrics are cotton denim chambray from Hancock Fabrics. The top of the side panel is the back side of the dark one. The cardigan is the lovely Aster Cardigan from Willow & Co / lbg studio. I very rarely have unfinished projects lying around (I guess I'm a freak like that, ha) but I cut this beauty right after I finished sewing my first Aster (see it HERE) and then I guess I had sewing-with-deadlines to do and this one got left behind. Awwww! The fabric is a firm cotton knit of some kind, I'm sorry but it's from my stash and I don't even remember where I bought it. It might be a bit hard to see but it is pale mint colored and the faux piping on the collar is neon pink. The star buttons are from Hancock Fabrics. And you know I LOVE this pattern. A simple sew with a non simple result. Perfection Vanessa!! Get your own Aster Cardigan Pattern HERE. Phew, this lady have had 2.5 months of summer vacation and I think she is ready to go back to school now....what do you think, huh?! And NOW back to the upcoming Sewing for Kindergarten. I decided to simplify the series this year and skip the sew along and competition and just do the sewing/inspiration series. BUT if you feel like sewing along and competing with the school clothes you have made (or want to make) I have the perfect place for you to go......Willow & Co Patterns Back to School Contest. Read all about it HERE. I might post a few more school outfits this week if I can get it together so stay tuned. And make sure you do not miss to enter my giveaway for a $50 gift card to Organic Cotton Plus that ends this friday the 29th of August 2014 HERE. The whole outfit looks lovely. It made me chuckle when you said you had an idea but realised it wasn't your idea after all. That happens to me all the time lol! Haha YES....I hate when that happens ;-) But at least in that situation we KNOW inside ourselves that we did in fact get that idea....at the same time as another person, haha! Great outfit!! Looking forward to the Kindergarten series again! Love how you played with the denim, so cute and still goes with everything. 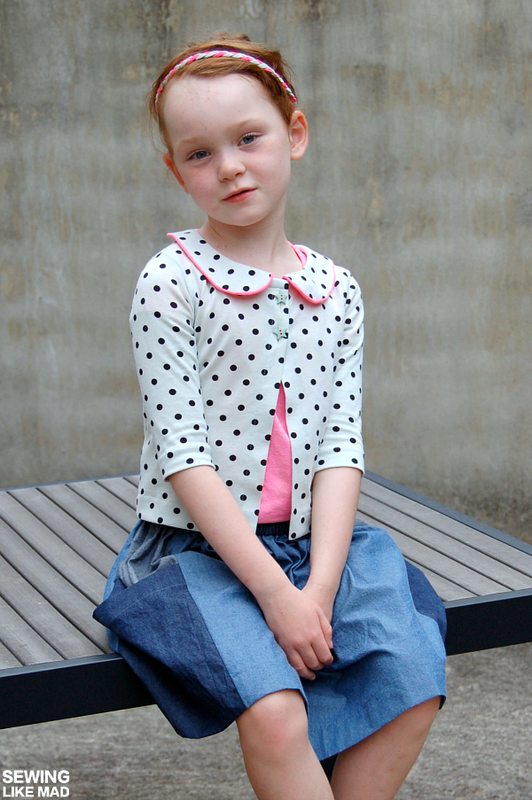 My kids wear a school uniform, its very cute, but you won't catch me sewing one! How cute! i love both pieces. Glad you had a fabulous holiday!! this is so adorable Mie! 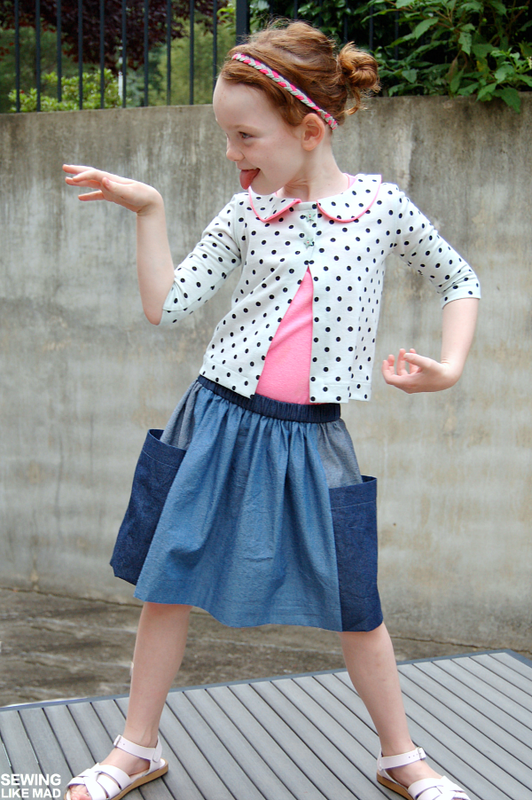 I love the different color denims on the skirt! So simple and so cool! Love it! I need to make more skirts now! W. is such a gorgeous model. How exciting to start first grade! I love her outfit. The fabric combo on the skirt is so cool! I want this outfit- especially that cardi! I LOVE this entire outfit, Mie. I'm especially fond of the skirt, though. Perfection! I thought the cardi was white,but now that I read it is mint, I like it even more! Such a cute outfit!! Great outfit, Mie! I guess I will have to make a couple of skirts like these for my daughters too... And match them with some nice and comfy Aster cardigans. I'm in love with this pattern! such a sweetie and so lucky to have you as a mom. Super cute outfit! What a cute outfit! But I mean, what would not look cute on your little first grader? Love the big pockets on the skirt, and as for the Aster, now it is warming up in my corner of the world I am rubbing ma hands in anticipation of sewing my first Aster cardi! Very cute! I love the big pockets on the skirt!! 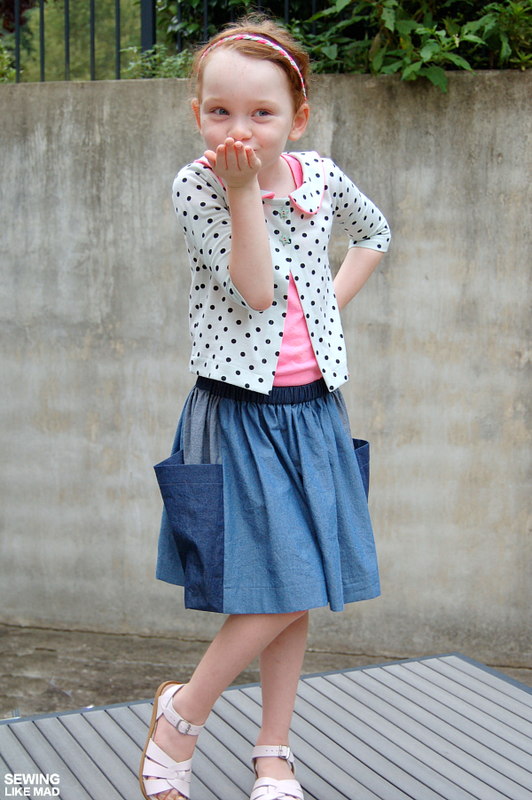 Very beautiful, both skirt and cardigan! Loved it! That mint fabric is super cute and she looks adorable as allways! And how exciting to start first grade! Time flies.